Why, you may ask, that particular quote, here on a quiet Monday morning at the end of August? Especially here, in this blog, where we all usually delight even (perhaps especially!) in silly laws? And the impact of those good intentions is imposing one hell of a burden on historical research using critical records. Please read that sentence carefully. And then tell me if you can find one word in there that limits this blanket “never tell anybody anything about concealed permit holders” to people who are alive today. And you know what that means, right? Every record that contains information about anyone who has ever had a permit to carry a concealed weapon in Virginia can’t be disclosed. And you know when Virginia first started issuing permits to carry concealed weapons? And where are the permits and orders? Ordinary every-day bread-and-butter genealogy-type court records. 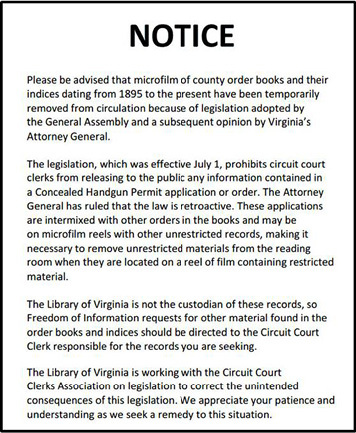 As a result of Chapter 659, the notice you see above illustrating this blog post is what you will see at the Library of Virginia, Virginia’s fabulous state archives-and-library in Richmond, where — until this law was passed — you could simply pull a reel of microfilm out of a drawer and immerse yourself in the minutia of late 19th and early 20th century court records. But the court record books and the index rolls to those record books have now been pulled from the accessible microfilm. And not just a few records. At last count, there were 220 rolls of microfilm including court order books, indexes of court order books, indexes to court cases that are affected. At least 135 of those reels contain nothing but records that are more than 100 years old. And talk about no fiscal effect on the courts? Tell that to the circuit court clerks in Virginia’s counties, who now can’t simply let members of the public do their own searches in those older records but instead have to assign staff to do lookups in these older volumes for fear that one of them might contain a shred of information about an 1896 permittee. Well, Judy, it looks to me as if part of the solution is getting genealogists elected to all state and federal legislatures so someone can at least bring some good sense to the chaos of closing all records to the average citizen!! Which are you going to run for first—state or local??? If nominated, I will not run. If elected, I will not serve. But I will serve as an official public nag when I catch ’em doing something foolish. And WHY should it be a secret about just who has applied for a concealed weapon permit? It might be nice to know that Joe Neighbor is packing concealed. The earlier law about redacting SSN from permit application makes some sense. But a blanket proscription of release of any information about permit applications seems like a lot of overkill. One reason is so that thieves looking to obtain weapons illegally don’t have addresses to target for burglary. Another is so that victims of domestic violence or other crimes against women aren’t putting the current physical location of those women at the fingertips of their attackers. Still, the pendulum has definitely swung too far in the non-disclosure direction. I hadn’t thought of that reason, Rorey, but boy you are right about that. That’s a nice way of putting it, Anne! According to the article link below, the NRA has been purchasing lists directly from the county representatives for years. Along with hunting license applicants. Interesting that the Virginia Department of Game and Inland Fisheries does not appear to have a restriction on providing the hunting license applicants but does withhold records relating to subscribers of their Virginia Wildlife magazine. I would think that hunters would be a more worthy target for firearms thieves. And less risky than trying to pry a concealed weapon off of a permitted carrier. I’d comment on that, except that if there is anything I have learned over my many years in the online community it’s that you do not want to get into an … um … unnecessary discussion with the NRA.